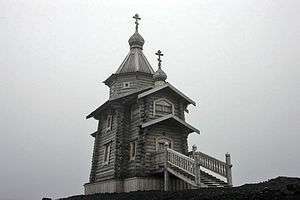 Trinity Church, Antarctica, a 15m-high siberian pine Russian Orthodox church that can accommodate up to 30 worshipers. It opened in 2004, and it is manned year-around by Orthodox hieromonk priests volunteering for the Antarctic assignment. Christianity in the 21st century is characterized by the pursuit of Church unity and the continued resistance to secularization. Church of the Nativity of Mary - a catholic parish church in Karlova Ves, Bratislava (Slovakia). With the election of Pope Benedict XVI, there was decentralized beatifications and reverted a decision of John Paul II regarding papal elections. In 2007, he set a Church record by approving the beatification of 498 Spanish Martyrs. Major lawsuits emerged in 2001 claiming that priests had sexually abused minors. In June 2004, the Ecumenical Patriarch Bartholomew I's visit to Rome afforded a meeting with Pope John Paul II, for conversations with the Pontifical Council for Promoting Christian Unity and for taking part in the celebration for the feast day in St. Peter's Basilica. There was the Patriarch's partial participation in the Eucharistic liturgy; full participation in the liturgy of the Word, joint proclamation of the Nicene-Constantinopolitan Creed in Greek, and as the conclusion, the final Blessing imparted by both the Pope and the Patriarch. The declaration of Ravenna in 2007 re-stated the notion that the bishop of Rome is indeed the protos, although future discussions are to be held on the concrete ecclesiological exercise of papal primacy. Since the election of Pope Francis in 2013, he has displayed a simpler and less formal approach to the office, choosing to reside in the Vatican guesthouse rather than the papal residence. Following the resignation of Benedict, Francis became the first Jesuit pope, the first pope from the Americas, and the first from the Southern Hemisphere. In February 2001, the United Methodist Church organized the Saint Brigid of Kildare Monastery. It is a Methodist-Benedictine residential monastery for women in Collegeville, Minnesota. Postmodern Christianity has influenced the emerging church movement. Critics allege, however, that this movement's understanding of faith has led many of its adherents outside the bounds of traditional Christianity. 2001 – New Tribes Missionaries Martin and Gracia Burnham are kidnapped in the Philippines by Muslim terrorist group; Baptist missionary Roni Bowers and her infant daughter are killed when a Peruvian Air Force jet fires on their small float-plane. Though severely wounded in both legs, missionary pilot Kevin Donaldson landed the burning plane on the Amazon River. 2003 the Mission Province is established in Church of Sweden: new era for confessional Lutheranism in Scandinavia. 2003 – Publication of Back To Jerusalem Called to Complete the Great Commission – Three Chinese Church Leaders with Paul Hattaway brings Chinese and Korean mission movement to forefront; Coptic priest Fr. Zakaria Botros begins his television and internet mission to Muslims in North Africa, the Middle East, Central Asia, and western countries, resulting in thousands of conversions. 2005 Kitzmiller v. Dover Area School District rules intelligent design as "unscientific", banning the teaching in American science classes and thereby dealing a major blow to creationism. 2006 – Abdul Rahman, an Afghan Christian convert, is forced out of Afghanistan by local Muslim leaders and exiled to Italy. Missionary Vijay Kumar is publicly stoned by Hindu extremists for Christian preaching. 2007 The Creation Museum opens in Kentucky USA. 2008 Conservative Anglicans indicate that they plan to split from liberal Anglicans in "The Jerusalem Declaration"
↑ Vallely, Paul (14 March 2013). "Pope Francis profile: Jorge Mario Bergoglio, a humble man who moved out of a palace into an apartment, cooks his own meals and travels by bus". The Independent. Retrieved 4 June 2013. Farrell, Joseph P. God, History, & Dialectic: The Theological Foundations of the Two Europes and Their Cultural Consequences. Bound edition 1997. Electronic edition 2008. González, Justo L. (1985). The Story of Christianity, Vol. 2: The Reformation to the Present Day. San Francisco: Harper. ISBN 0-06-063316-6. Hastings, Adrian (1999). A World History of Christianity. Wm. B. Eerdmans Publishing. ISBN 0-8028-4875-3. Latourette, Kenneth Scott (1975). A History of Christianity, Volume 2. San Francisco: Harper. ISBN 0-06-064953-4. Shelley, Bruce L. (1996). Church History in Plain Language (2nd ed.). ISBN 0-8499-3861-9. History of Christianity Reading Room: Extensive online resources for the study of global church history (Tyndale Seminary). Historical Christianity, A time line with references to the descendants of the early church.